Given its on street price, for $565 this buy is certainly not bad. The size, weight and clarity are impressive to say the least. The Aimpoint Micro H-1 Red Dot Sight is a bit more tacticool in comparison to the Micro T-1/ The Aimpoint Micro H-1 Red Dot Sight is a bit more skinny. The weight has beenreduced almost dramatically. Even though it is light to feel, the finish is rock solid. You will not feel any cheapness here. The 3v Li battery powers the Aimpoint Micro H1 Red Dot Sight. One cna purchase the batteries from a local grocery shop too. The Micro H-1 can run for 5 years on a single battery. For any buyer, this means no longer do you have to run the store very now and then for batteries. If one were to pay attention to the details on this smart creation, one would realize that Aimpoint invested a lot of heart and soul to devise the concept. The 2 nubs serve multiple functions. One can wind, the other can control elevation. Adjustments of this have been imprinted onto the multi-tool. For those who don’t take time out to read the manuals, this feature is quite helpful. Those who have taken proper training in Shaolin will find the tool to work as a lethal shuriken. The mounting systems come in 2 parts. The LRP micro system neatly attaches onto the Picatinny rail. One can even easily lock out the lever so that it says tight and in position always. When you first open up the box, you will see that the Aimpoint Micro H-1 Red Dot Sight will look a bit narrow than expected. 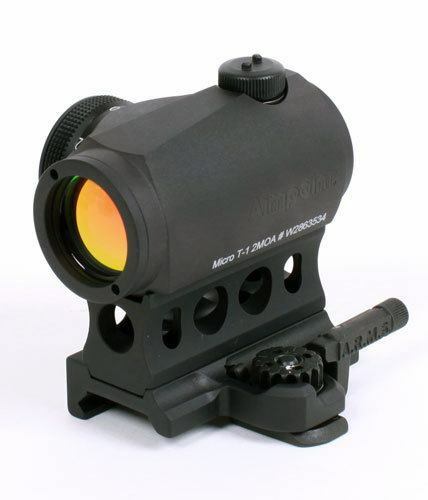 With a 3/4 inch lens diameter, the Aimpoint Micro H-1 Red Dot Sight is quite the buy. The H-1’s smaller tube allows one to close-up fast. For shooting in short ranges, this model is perfect. It sighting system is devised to provide decent sighting. The 4 minute of angle size of the dot allows the user to shoot competitively. It can be used for hunting and tactical operations. The settings 7 manages to give crisp pictures while for bright sunny settings, one could use the brighter settings. The solid, well-constructed and well fitted Aimpoint H1 is perfect for shooting in back up sight. Remounting allows one to keep the zero at original zero always. This handy feature will appeal to those who like to hunt. Posted in AimpointTagged Aimpoint, Aimpoint H-1, Aimpoint Micro, Red dot sight.